Place the pork belly and shoulder in a heavy bottomed pot. Add water and the bouquet garni and cook over low heat, stirring occasionally. After 6 hours, stir in the salt and pepper and remove from the heat. Discard the bouquet garni. Once the meat is cooled enough to handle, transfer it to a mixing bowl, using forks, shred the meat (you don’t want it to become mush- keep the natural shreds of the pork). Divide the mixture among several small containers. Top each portion with pork fat to completely cover it, fold the mixture together a bit then wrap each container in plastic wrap. Place in the refrigerator and let them sit for 3 days before serving. *** Shape into a circle on the plate, sprinkle some salt over the top (if needed), garnish with thyme leaves, and ENJOY! Oh- forgot to mention- serve this with toasted baguette slices. Place the baguette rounds on a cookie tray, drizzle with olive oil, sprinkle with a little salt and ground white pepper, and bake at 350 until they reach your desired doneness. The ones in the pictures are really crispy, but they don’t have to be. *1 sprig flat parsley, 2 sprigs of fresh thyme, 1 bay leaf -all tied with a string, or placed in cheesecloth tied off with a string so that you can get it out. 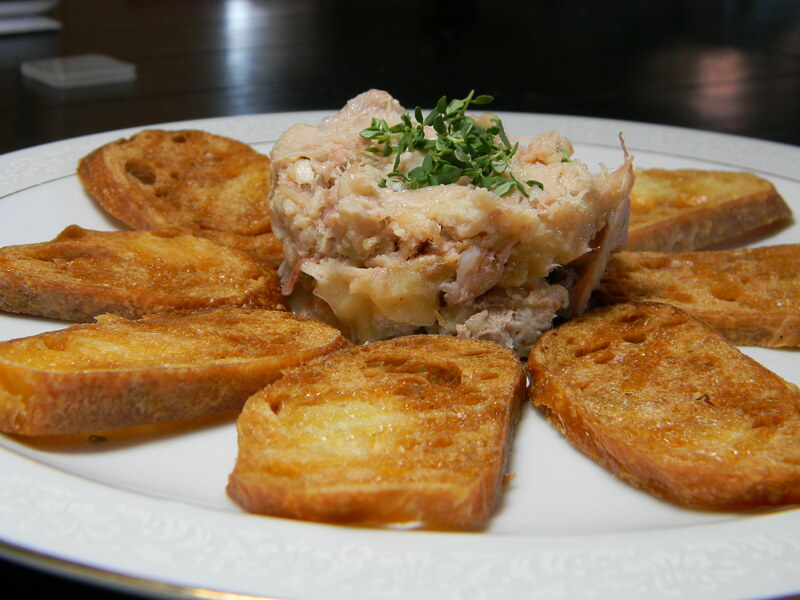 **There are several different options for pork fat: we got rendered fat from pork skins from our local latin market, and though that’s much more liquid that what rillettes usually has, it works well. We also tried it with leftover bacon fat, and that worked really well too. As a third option, a butcher or a really good grocery store can probably sell you some pork fat/lard. *** You really do want to wait 3 days. Try a little now for fun, but 3 days and beyond, it’ll be delicious. Also- this stuff keeps for a really long time in the fridge because it’s sealed in the fat… at least a month. Ah, les rillettes!!! We went to Les Halles in New York and our first course was “rillettes” of course. Thanks for the recipe! Will have to try it!